Who is it for? Make Up For Ever Artist Acrylip Paint 401 is For those looking for a lip shade that works more like a stain and stays on for a couple of hours. The product comes in a squeezy tube that is completely black and a strip of the color of the lip paint. The print is all in white. The tube comes in a box packaging which uses the same color code system…it has all the details mentioned on it. The tube in which the product comes in has a sponge at the mouth so it dabs on just the right amount of product onto the lips. I’m not extremely impressed with the packaging, it’s just about okay. 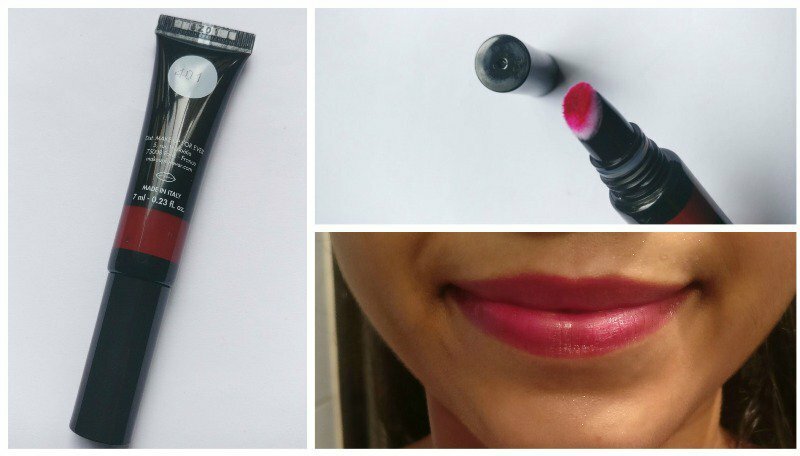 It’s a lovely raspberry like a shade that can be used during the day or even for a night out. It can be easily played up or down, depending on the look you are going for. It’s a very multi-purpose product and can even be used as a cheek or eye stain. It is of a smooth and creamy texture that glides onto the lips easily. This was a little disappointing for me. It does last for a few hours but then, a lot of lipsticks do too. I was expecting the staying power of this product to be amazing. Now, this is not a product that everyone can afford. It’s highly priced, but then again, it’s one of the bigger brands. In terms of pigmentation, this product does a good job. Even the tiniest amount of product will show a lot of color. In fact, even for full coverage lips, a very small amount of this product is needed. Once the product is applied on the lips, if you allow it to sit for a few minutes, it settles into a matte. So there’s no issue of it transferring or smudging. What I recommend & repurchase? No. I’m not very impressed with the product. It does a good job, but not something I’m too happy with.